Research has shown that nine out of ten people will have problems with their feet before they are 30 but only one in ten will visit a Chiropodist or Podiatrist. Many people will not realise that other aches and pains may be caused by problems with their feet. The Parkgate Chiropody Practice specialises in treating a wide range of foot conditions and disorders which involve both chiropodial and podiatric disciplines. Chiropody focuses on the diagnosis, advice and treatment of foot problems and conditions. With Podiatry, attention is directed towards gait problems involving the foot, ankle, knee hip and back such as problems with walking or sports injuries. We use both advanced technology and traditional therapies to treat a variety of foot and lower limb problems. Here is an alphabetical guide to some typical conditions and how we treat them. If you would like more information about any of these conditions or have symptoms of something not listed here, please contact us or call us on 01709 522334 for a free foot health assessment. Athlete’s foot is a fungal infection called Tinas Pedis. It can lead to intense itching, cracked, blistered or peeling areas of skin, redness and scaling. It can occur on moist, waterlogged skin especially between the fourth and fifth toes, or on dry, flaky skin around the heels or elsewhere on the foot. There are a number of different antifungal medicines for athlete's foot available without prescription. These are provided as creams, ointments, lotions, powders, and liquid or dry powder sprays, and are applied directly onto the infected area(s). But if the condition keeps recurring or gets worse and spreads to the nails, consult us as we can prescribe broad-spectrum anti-fungal medication to eliminate the fungus if local treatment or your prevention regime hasn't worked. There are two main types of arthritis, Osteoarthritis and Rheumatoid Arthritis. Osteoarthritis is the main form of arthritis and is known as the "wear and tear" disorder. It can affect any joint. The big toe is especially susceptible due to the tremendous amounts of pressure that is placed upon it while we are walking. Osteoarthritis causes the cartilage to erode and then causes the bone ends to fuse which results in stiffness and aching of the joints. Osteoarthritis can also follow a fracture or a bad sprain to the foot. Rheumatoid Arthritis is a systemic disease, which affects the whole body. Rheumatoid arthritis affects all the joints and muscles in the foot. It affects more women then men and can be inherited. The insides of the joints become swollen and stiff. It affects the feet by causing a gradual collapse of the arch; the toes become contracted and draw back. 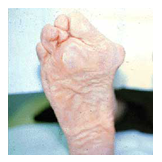 Bunions are a common amongst elderly rheumatoid arthritic patients. this sensation as "walking on pebbles". Corns, calluses and ulcers may develop under the soles of the feet. Arthritis is not cureable so treatment involves managing the symptoms to alleviate discomfort such as treating corns, calluses, thick nails and ulcers. This may involve paring down the callus and corns and applying redistributing padding. We may also prescribe protective shields and orthoses to redistribute pressure away from the affected area. In the case of a rheumatoid arthritic patient, we will work with your GP and other specialists such as physiotherapists, rheumatologists and specialist nurses. if necessary. Your GP may prescribe the appropriate anti-inflammatory drugs. It is also important to consider that rheumatoid arthritis is an autoimmune disease. It can affect other parts of the body and may slow down healing response times. A bunion or "Hallux Valgus" appears as a bony prominence at the first joint on the inside of the foot, below the big toe. Normally the bones comprising the big toe and the long bone (first metatarsal) which leads up to it are in a straight line. As the first metatarsal drifts away from the second metatarsal at an angle, the foot widens and the head of the first metatarsal becomes prominent producing the bunion. As a consequence, the tendons which run circumferentially around the joint between first metatarsal and big toe become destablised causing the toe to become angled excessively towards the second toe. There are many things which can contribute to and exacerbate the occurence of bunions such as choice of footwear, however a propensity to develop bunions is hereditary. Bunions are generally only painful when wearing enclosed shoes and so are often more symptomatic during the winter months. If the foot becomes very splayed, forcing the big toe further across the second toe, it may produce a hammer toe type deformity due to the crowding. The hammer toe may then become painful if it rubs against the top of the shoe box or underneath as the toe is forced up and pressure is then placed on the second metatarsal head. Bunion pain usually disappears when wearing sandals or walking barefoot. It is only usually present at rest or at night if the joint has become arthritic as well. Bunions are usually treated conservatively by wearing wider fitting soft shoes and/or by using a splint or spacer between the big and second toes to straighten them. We can also prescribe an arch support orthotic if the bunion is associated with a flatter foot. If the bunion becomes increasingly painful, inconvenient or disfiguring we can refer you for surgery such as a Scarf Osteotomy during which a the metatarsal is divided in a "Z shaped" fashion to enable it to be securely repositioned closer to the second metatarsal again. Click on the video link on the right to view an animation of this procedure. This will reduce the width of the foot and also realign the tendons to straighten the big toe. 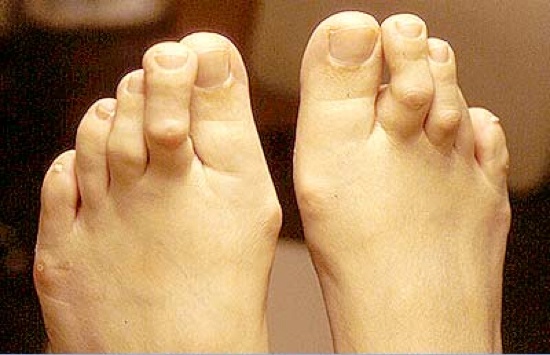 Bunion surgery generally requires a general anaesthetic. Post-operatively your foot be heavily bandaged for five weeks. You will be able to walk with the aid of crutches and a special protective shoe for the first two weeks following surgery and return to work at this time if you are not required to stand for long periods. Three to four months after bunion surgery you will be able to wear narrower shoes again. If arthritis is present then the joint(s) may be fused which means some degree of physiotherapy will be required after surgery to re-establish a functional gait. Additional corrective surgery is also possible if the big toe is still malaligned after the metatarsal is repositioned. This is known as an Akin Osteotomy where a small segment of bone is removed from the inner side of the big toe itself. When we walk or stand, our body weight is carried first on the heel and then on the ball of the foot, where the skin is thicker, to withstand the pressure. When this pressure becomes excessive, some areas of the skin thicken, in the form of corns and callus, as a protective response. A callus, or callusity, is an extended area of thickened skin on the soles of the feet, and occurs on areas of pressure. It is the body's reaction to pressure or friction and can appear anywhere the skin rubs against a bone, a shoe, or the ground. You can control a small amount of hard skin by gently rubbing with a pumice stone, or chiropody sponge occasionally when you are in the bath. Use a moisturising cream daily. If this does not appear to be working, and especially if the callus becomes painful and feels like you are "walking on stones" seek advice! We will be able to advise you why this has occurred and, where possible, how to prevent it happening again. We will also remove hard skin, relieve pain, and redistribute pressure with soft padding, strapping, or corrective appliances which fit easily into your shoes. The skin should then return to its normal state. How do Circulatory Problems affect feet ? Poor circulation in the feet and legs is known as Peripheral Vascular Disease. It is most commonly caused by artherosclerosis - "hardening of the arteries". The arteries carry blood from the heart all over the body including to the extremities, a gradual thickening and hardening of these arteries impairs this blood flow. Those with diabetes are more likely to develop poor circulation to the foot. Other risk factors include lack of physical exercise, smoking, high blood pressure and high cholesterol levels. Lack of blood flow means vital elements such as oxygen does not reach the tissues in the foot which leads to infections and sores occuring. These will not heal well without special care in many cases. It is vitally important therefore to protect the foot to prevent cuts and accidental trauma. Great care needs to be taken with nail cutting and general foot health. Claudication - a dull cramping pain in the calf which repeatedly occurs even when walking short distances. It is relieved by rest. Numbness or tingling in the foot or toes. Changes in the colour of the skin - it may appear paler, blue or reddish. Changes in skin temperature - the foot may feel cooler to the touch. The occurence of infection and sores which do not heal properly. Poor circulation can be treated by your GP in a number of ways. Good control of blood glucose levels is vital if diabetes is present. Other factors such as lack of exercise, high blood pressure, smoking and high cholesterol levels need to be addressed. Drugs may be prescribed to prevent blood clotting such as antiplatelet agents or anticoagulants. Angioplasty may be performed to enlarge narrowed peripheral arteries for example. It is important also to seek professional advice regarding general footcare. We will evaluate the condition of the feet and advise you how to prevent complications developing. We provide information on suitable footwear. We also offer a nail cutting service and treatment of corns or calluses to prevent sores, wounds or infections developing. These are the most common form of corn and appear as small concentrated areas of hard skin which is around the size of a small pea. Usually found within an area of thickened skin or callus, they are a sign that the foot or toes are not functioning properly. Appearing between the toes, these form in a similar way to hard corns but are usually white and rubbery in texture. Caused by sweating or inadequate drying between the toes, they can be prevented by improved foot care and the application of astringents to reduce sweat retention. These are tiny, painless corns which may occur singly or in clusters on the sole of the foot. These can be extremely painful and will bleed profusely if cut. Corns left untreated for a long time can appear to become more firmly attached to the deeper tissues and can therefore become painful. Never be tempted to cut corns yourself and avoid using corn plasters or paints as these can burn healthy tissue around the corns. Use a pumice stone to gradually remove thickened skin or relieve pressure between the toes with a foam Toe Separator. If the corn persists or becomes painful, seek advice. We can painlessly remove the corn, apply padding or provide orthotic insoles to relieve pressure, providing long-term relief. Cracked heels or heel fissures are caused by a build up of dry skin (xerosis) on the outer rim of the heel. It is exacerbated if the skin in this area is callused. In most cases it is a cosmetic nuisance but if the cracks or fissures deepen, they may bleed and it can become painful to stand. In severe cases these cracks can become infected. Daily moisturising with a rich, oil based moisturiser twice daily will help keep the skin supple in this area. Dry skin can be gently reduced with a pumice stone. If the problem persists and becomes severe, we can encourage the cracks to heal by debriding the area to remove the hardened skin. Strapping the area may also be required to hold the fissures together during the healing process. We can also prescribe emollients and/or orthotic insoles as preventative measures and give advice on footcare. Diabetes can cause complications including a loss of feeling in the feet, known as Neuropathy. The most common form is Peripheral Neuropathy which occurs when the nerves running from the brain to the organs, muscles, skin and glands are impaired. The condition can cause an inability to detect heat, cold and even pain, putting the diabetic at risk of being unable to sense any cuts or sores on their feet. Left untreated, these injuries may become infected leading to ulceration which could result in amputation. It is vital therefore, that people with diabetes should check their feet on a daily basis for any problems. The feet should be protected from extremes of hot and cold and the feet should be moisturised to keep the skin soft and supple. Regular exercise is important to maintain a healthy blood flow to the feet. Shoes and socks should be worn at all times. 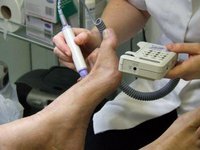 As with Peripheral Vascular Disease, it is important to seek professional advice regarding general footcare. We will evaluate the condition of the feet and advise you how to prevent complications developing. We provide information on suitable footwear and prescribe orthotics if necessary. We also offer a nail cutting service and treatment of corns or calluses to prevent sores, wounds or infections developing. A true flat foot or Pes Planus with no arch present is extremely rare, less than 5% of the population have completely flat feet. Most people have a normal to low arch and but can suffer from over pronation or "fallen arches" when walking, running and standing. Whilst the foot appears normal with a clear arch when sitting down, any weight bearing activity causes the arch to collapse and the ankles to roll inwards. Pronation is part of a natural gait cycle, it acts as a shock absorbing mechanism and is followed by supination or rolling out to help propel the feet forward. Overpronation occurs when the foot pronates too deeply and for too long without allowing the foot to recover and supinate. This can lead to a range of complaints such as heel, knee and back pain. Over pronation has many different causes. Being overweight and the aging process can weaken the arch of the foot. It can also occur during pregnancy as a result of increased elastin being produced by the body. It is also common amongst athletes, especially runners. Asymptomatic flat feet are usually no cause for concern. But if there is associated foot or lower leg pain or if the condition affects the knee or back we can prescribe orthotics to support and raise the arch of the foot to provide lasting relief from discomfort and pain. Fungal infection of the nail, Onychomycosis, is generally caused by dermatophytes, most commonly Trichophyton Rubrum or Trichophyton Mentagrophytes. These microscopic organisms grow beneath the nail and in the nail bed and live of the protein, or keratin, of the nail. The condition usually begins at the far end of the nail and often appears as patches of white or yellow discolouration initially. Left untreated, it can advance into the base of the nail where it can attack the nail matrix. This will cause the nail to become thickened and deformed as it grows. The nail may then grow into the skin and become ingrowing. Infected nails may also become brittle and split or crumble easily. Whilst dermatophytes are present on most people's skin, those with a lower immunity due to other systemic conditions such as Diabetes or poor circulation may be at greater risk of fungal nail infections. Initially, a sample of nail will be taken to be sent to the laboratory for analysis to confirm the diagnosis. We will then prescribe medication such as Lamisil and/or Terbafine. We can also surgically treat any ingrown areas if necessary and generally improve the appearance of the affected nail. Fungal nails are notoriously slow to respond to treatment however as the nail is slow growing. Haglund's Bump is a bony prominence on the back of the heel. Problems occurs when the soft tissue around the Achilles tendon becomes irritated by pressure placed on this prominence by the back of the shoes. This can lead to bursitis where the retrocalcaneal bursa or fluid filled sac which rests between the Achilles tendon and the heel bone (calcaneus) allowing the tendon to glide against the calcaneus during movement of the foot becomes inflamed. Inflammation and pain can be treated with a course of nonsteroidal anti-inflammatory drugs such as Ibuprofen and the application of ice packs. We can also recommend stretching exercises to relieve tension in the Achilles tendon and give advice on suitable footwear. Heel lifts, heel pads or wedges to cushion the heel inside the shoe, or orthotics may also be prescribed. If these measures fail to provide adequate pain relief, we may refer you for surgery. Affecting the second to fourth toes on either or both feet, toes which become mishapen or clawed are referred to as hammer or mallet toes. Persistent traumatization from ill fitting shoes which are too short or narrow can impair the normal function of the muscles and tendons surrounding these toes so they will not allow the joints to relax and straighten normally Bunions, flat feet and arthritis may also cause hammer toes. They are usually accompanied by corns and sores as these joints rub against the shoe. Pressure may also build up in the ball of the foot resulting in hard skin and calluses forming. Left untreated, hammer toes can become rigid and will not respond to non-surgical treatment. Selecting shoes which do not force the toes against the front of the toe box with a low heel is essential. We can provide padding for corns and calluses and also prescribe orthotics to help redress the muscle/tendon inbalance. Inflammation and pain can be treated with a course of nonsteroidal anti-inflammatory drugs such as Ibuprofen. Corticosteriod injections may also be beneficial. Splinting or strapping the toes may also be applied to realign the toes. We can also advise on exercises to help strengthen the muscles to prevent the condition recurring. If these measures fail to provide adequate pain relief or the affected toes have become rigid, we may refer you for surgery. Several conditions cause heel pain. Nerve Entrapment - known as Tarsal Tunnel Syndrome involving the Tibial nerve on the inside of the ankle. Haglunds Deformity or Pump Bump - affecting the soft tissue near the Achilles Tendon. Achilles Tendon Bursitis - a condition which primarily affects athletes. Sever's Disease - this occurs in children and young teenagers and is related to overuse of the bones and tendons in the heel. However, the most common cause of heel pain is Plantar Fasciitis. This inflammatory condition is caused by overuse of the arch tendon on the underside of the foot. The arch tendon or Plantar Fascia is a thick band of tissue which runs from the heel to the front of the foot, just behind the toes. The pain is associated with the degeneration of the collagen fibres close to the heel bone (calcaneus). It is frequently worse in the morning as the tendon tightens overnight and may ease as you start to move about and the foot "warms up". Over tight calf muscles leading to prolonged and/or high pronation of the foot can lead to the tendon becoming inflamed. Those with a high arch may also be more susceptible. Around 70% of patients with plantar fasciitis also have a Heel Spur which is visible on X Ray. A heel spur is a hook of bone protruding from the base of the foot at the point where the plantar fascia is attached to the heel bone. Rest is vital to prevent placing unnecessary stress on the plantar fascia thereby aggravating the injury and causing further inflammation. Applying ice packs will help reduce pain and reduce any swelling. And seek professional advice! We can tape the foot and provide instruction on good taping techniques to allow the foot to rest. We can also prescribe orthotics to help restore normal foot biomechanics which can also be combined with corticosteroid therapy and/or other anti-inflammatory medication. We may also recommend the use of night splints which gently stretch the calf muscles and planter fascia overnight reducing painful stiffness upon waking. Other exercises and stretching techniques will also be demonstrated. An ingrown toenail, Onychocryptosis, is an extremely painful condition where either one or both sides of the nail cut into the nail bed as it grows out. Inevitably, the affected area becomes infected easily unless it is treated early. Signs of infection include redness and swelling. It is caused mainly by improper cutting technique when trimming the nails, wearing tight footwear, inadequate foot hygiene, accidental trauma to the nail, fungal or bacterial infection. An infected nail must be treated professionally. We can prescribe an antibiotic if necessary and treat the nail surgically to drain the infection and where necessary remove the section of nail which has become ingrown. Recurring ingrown toenails can be permanently removed by phenolisation which cauterises the nail matrix. We can also demonstrate nail cutting techniques to help prevent further recurrences and advise on footwear. Why do my feet cause lower back pain? Ankle Pain - Tibialis Dysfunction, Lateral Impingement Syndrome. Shin Pain - Compartmental Syndrome. Knee Pain - Chondramalcia Patella, Patella Tibial Syndrome. Successful treatment of these conditions often relies, at least in part, on orthotics, special shoe inserts, which correct dysfunctional biomechanics. A full biomechanical assessment will determine whether or not your lower back pain is associated with poor foot biomechanics requiring orthotics. Correctly used, orthotics can prevent deterioration by halting the development of foot deformity, improving pelvic alignment,reducing limb torsion and knee stress. Metatarsalagia is a general term for pain in the front or ball of the foot. It can be caused by several different conditions. 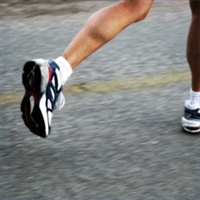 Overuse - runners and athletes may experience mild inflammation from over exertion. High heeled shoes - wearing high heels for long periods puts extra stress on this part of the foot. Being overweight - this puts extra stress on the foot in general. 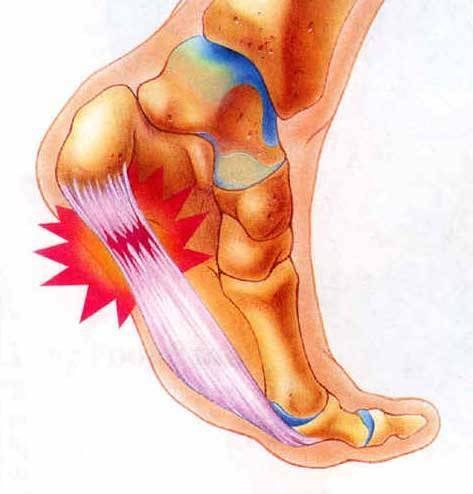 Morton's Neuroma - this condition affects the nerves which run between the metatarsal bones in this area of the foot. Pes Cavus - also known as claw foot. Treatment will depend on the underlying cause, however simple measures such as a change to more appropriate footwear, rest and losing weight may help. If the pain persists or swelling occurs you should seek professional advice. We can investigate the cause of the pain and give advice on ways to treat and prevent its reoccurence. We can prescribe metatarsal pads and inserts for your shoes to reduce the pressure placed on this area of the foot. If necessary, we can refer you for physiotherapy or surgery for example, to straighten hammer toes or treat Morton's Neuroma. Mortons Neuroma is a painful condition caused by an enlarged nerve situated between the third and fourth toes. Generally it is characterised by a burning sensation in the ball of the foot. This may also spread into the toes, particularly when wearing tight or narrow shoes or engage in activities which place pressure on the forefoot. Tingling or numbness in this area of the foot may also indicate a Mortons Neuroma. The nerve tissue (neuroma) thickens in response to repeated irritation or irritation. Wearing high heeled, tight or ill fitting shoes with a narrow toe box which place pressure on the toes. High impact athletic activities such as jogging which subject your feet to repeated impact. Accident or trauma to the foot. Normally there are no outward signs of Mortons Neuromas such as swelling or redness (erythema), but if the forefoot is squeezed between the thumb and fingers, the symptoms will be replicated. This is known as Mulder's Sign or Mulder's Click. Initially treatment will consist of padding and taping the foot to relieve pressure. An arch support may be prescribed if required to prevent over-pronation. A corticosteriod injection may be administered to reduce inflammation and advice on appropriate low heeled footwear with a wide toebox will be given. The foot can then be monitored over a week or so. If the pain disappears during this time, it normally indicates the neuroma is probably small and was caused by inappropriate footwear. However, if it persists, minor surgery may be necessary. Verrucae are simply warts which appear on the soles of the feet. They are caused by the human papilloma virus and are highly contagious. The virus thrives in warm moist environments such as bathrooms and swimming pool changing room floors. Initially, a verruca may appear as a small dark puncture which later turns grey or brown. It can become rough and bumpy with a cauliflower-like appearance and may develop a black spot in the centre. 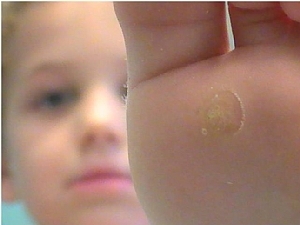 A verruca can grow up to a centimeter in diameter or spread into a cluster of small warts. A verruca has a lifespan of around 2 years so left alone may eventually disappear of its own accord. However they can be painful, particularly if they appear on a weight bearing area of the foot. There are several over the counter ointments available containing salicylic acid which are effective in most cases. However, if the verruca is particularly troublesome, we can remove it using cryotherapy often in a single appointment.